Today I remembered a band Lit that I first heard when I was in college between 2000-2002, and this inspired me to take a trip down memory lane. Back then I didn’t really own many CDs (I was still using cassette tapes). 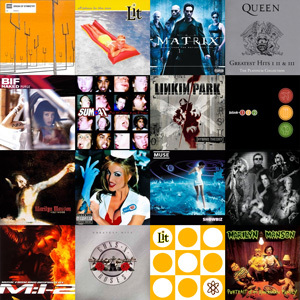 It was during this time that I started to fine-tune my music tastes, preferring Rock, Metal and Punk over the Pop and Dance music I favoured during my secondary school years. The group of people that I was socialising with at college had different tastes to the group of friends I had grown up with. My college friends were always happy to share their CDs and introduce me to new/old bands I had never heard of. I remember spending most of my time and money in shops like HMV and MVC, both went into administration, however HMV managed to claw its way out. I never did build up an impressive CD collection. I quickly moved to the digital format of Apple’s iTunes, and I’ve now started collecting vinyl records - check out my ever-growing LP hoard.